Using smartphones and tablets as shopping devices is a relatively new trend, and legacy retailers are using it to catch up to the original e-commerce giants. 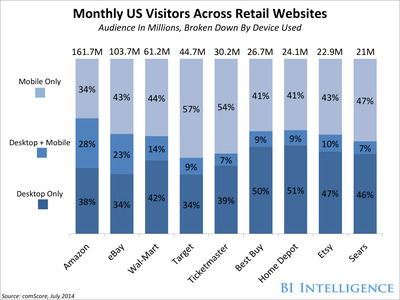 For example, Target’s audience is more mobile-centric now than even Amazon’s. In a new report, BI Intelligence takes an exhaustive look at the e-commerce market, looks at mobile’s surge, estimates holiday sales and shipments, tracks consumer behaviour, and outlines the mobile and online strategies that retailers are using to catch up in e-commerce. Mobile commerce growth is explosive. Purchases made using a smartphone or tablet rose 48% year-over-year (YoY) in the second quarter, to about $US8 billion. That’s three times faster than desktop-based e-commerce, and the fastest increase in mobile commerce spending since the first quarter of 2012. 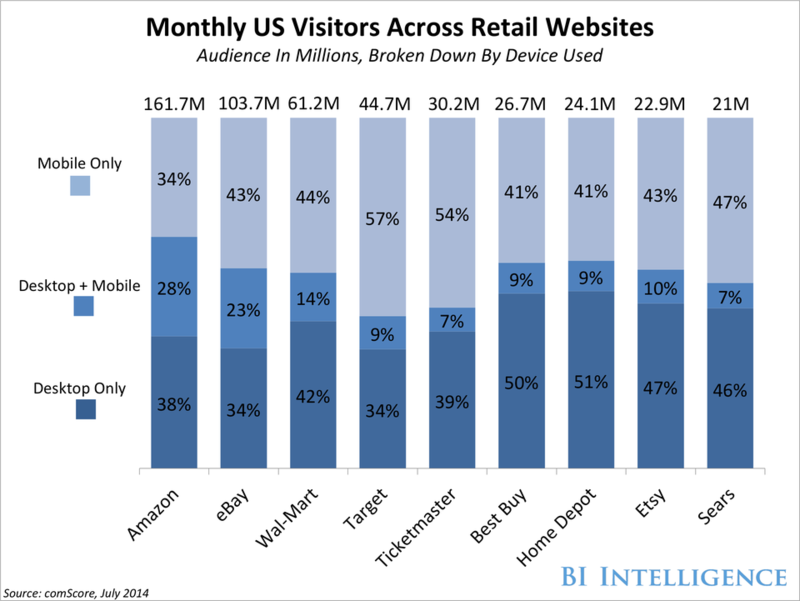 Traditional retailers are finally succeeding in mobile and e-commerce. This is thanks in part to the smartphone and tablet revolutions, which gave them a chance at a “do-over” in online retail. Growth in e-commerce sales finally stabilised in the second quarter of 2014 at an average of 22% at top retailers, including Nordstrom, Gap, Wal-Mart, Best Buy, and JC Penney. That means those retailers are actually growing faster than the e-commerce industry at-large. The final holiday quarter of the year is retailers’ do-or-die moment, a trial membership to BI Intelligence allows access to all our downloadable charts and data on the upcoming e-commerce holidays. To access the E-Commerce Market Update Report and BI Intelligence’s ongoing coverage on the future of retail, mobile, and e-commerce — including charts, data, and analysis — sign up for a trial membership today.